Combine asparagus tips, water, and kosher salt in a skillet; bring to a boil and cook until asparagus is tender to the bite but still crisp, about 2 minutes. Drain asparagus in a colander and immediately immerse in ice water for several minutes until cold to stop the cooking process. Drain and pat asparagus dry with paper towels. Place a piece of ham on a work surface, curved side of ham towards the top. 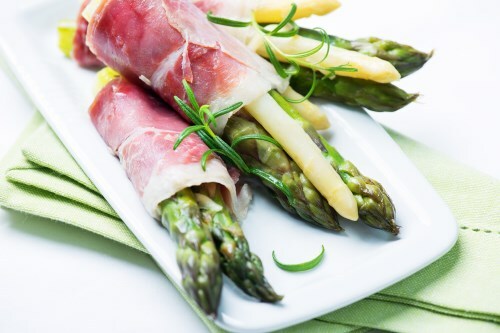 Put 1/2 teaspoon goat cheese in center of ham and top with 2 asparagus spears, tips pointing to curved side of ham. Fold left and right sides of ham over filling, and tie bundle together with a chive. Repeat with remaining asparagus, ham, goat cheese, and chives.